This post is dedicated to my past, current and future detox groups who are actively taking part in regaining their birthright…radiant health, through traditional ways. 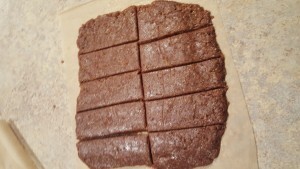 One of those ways is by making our own snack bars. I call them LisaBars…kind of a play on the ready made LaraBars that are my go to if I’m traveling. 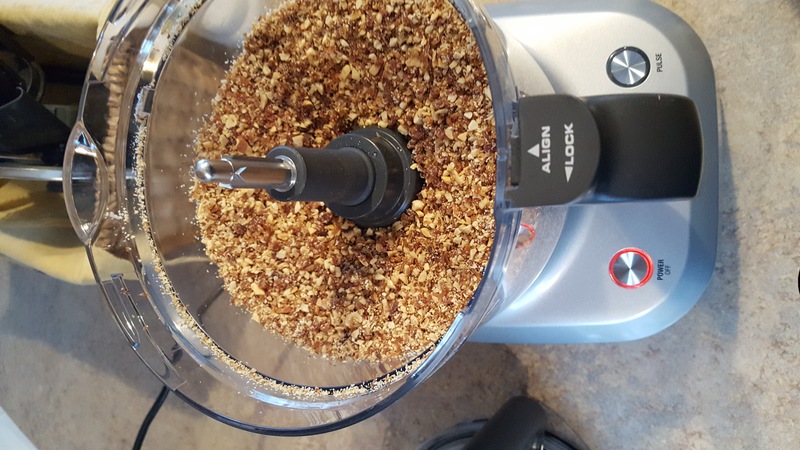 Place dates in food processor and process on low for about a minute. Scrape sides and add nuts. Continue to process for about a minute and a half on low…scraping sides as necessary. 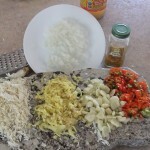 Add salt and coconut chips (half cup at a time works well) and process on low for 2 minutes. 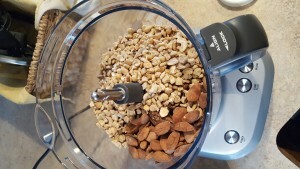 Add pumpkin seeds and process on low for about a minute. 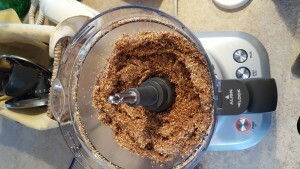 See if when you squeeze the mixture it sticks together, if so, you’re ready to roll it out. If not, process at 30 second intervals and recheck. 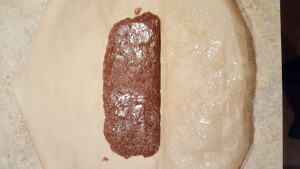 Plop the mixture onto parchment paper, cover it and roll it out to about 1/2 inch thick. 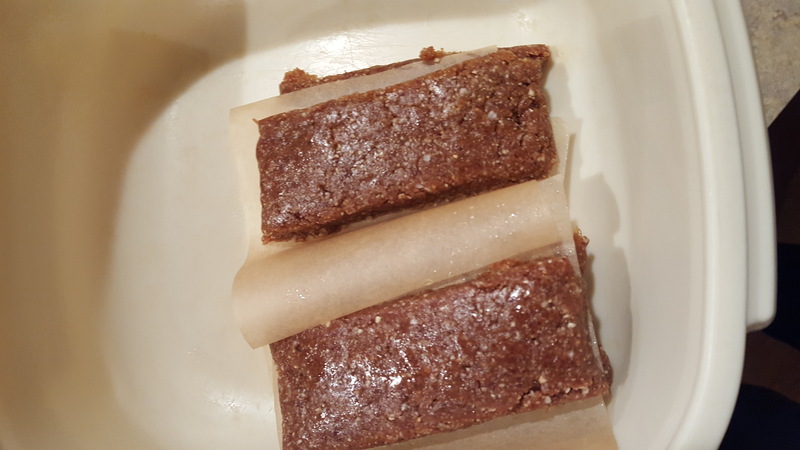 Cut into rectangles (or any shape you want, really), wrap individually with parchment paper, and place in frig or freezer. An alternate choice is to roll into 1 1/2 balls. ***I try to get organic nuts and seeds if at all possible. Also, when we are preparing foods traditionally, we soak and dehydrate our nuts and seeds to neutralize their innate anti-nutrients. Do NOT soak cashews more than 6 hours. I encourage you explore the techniques and reasons why here. 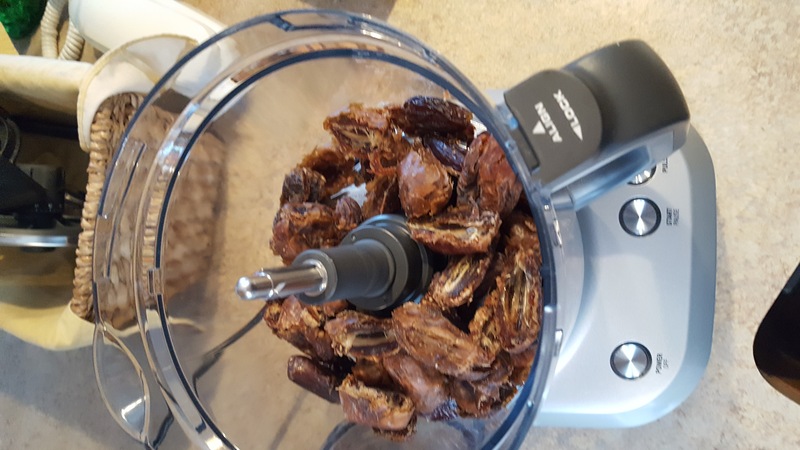 If you have a choice between raw and roasted nuts and you don’t have time (or energy) to soak and dehydrate, choose the roasted ones. GET CREATIVE: I often will take part of the batch and grate lemon zest into it for a lemon zingy bar. Go by taste. 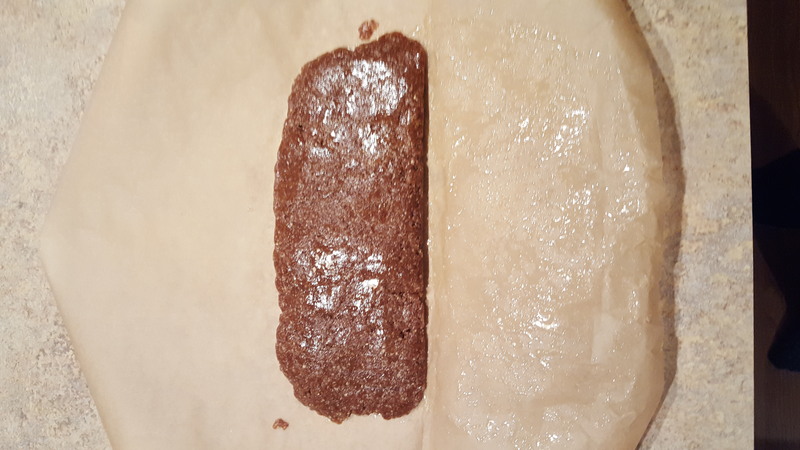 For this size batch, I would use about a tablespoon. 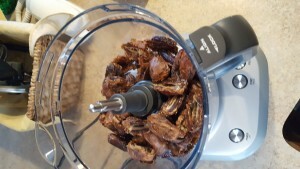 You can also use cinnamon and/or cardamom, dried cherries and other fruit, depending on your taste buds. Don’t have the specific nuts listed above…use what you have. Allergies? Respect them (and explore GAPS to heal them) and use what your body can tolerate. Remember…food is medicine. Make tasty traditional choices and you can thrive…for REAL! it’s oily after the coconut chips and pumpkin seeds – yum! Because we can heal. 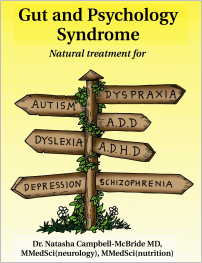 Because medications squelch symptoms which are warning signs that something isn’t working right. Because we don’t have to live with IBS, colitis and Crohns, ulcers and digestive problems, joint pain and skin problems, depression and anxiety, constipation and diarrhea. We can heal and seal our guts, rebalance our microbiome, and live the healthy, pain free lives we were designed to live. Is it easy? Well, it takes planning, preparation and commitment. Is it worth it? To answer that, you must ask yourself what price you would pay to have your body feel good. The testimonials around the world of people who have successfully healed from all the issues mentioned above tell me that it IS worth it. The fact that I personally no longer have any joint pain, which my family saw as hereditary, makes it worth it for me. So, what is GAPS? The letters stand for Gut and Psychology Syndrome. The acronym and diet were created by Dr. Natasha Campbell-McBride in 2004. Dr. Natasha has helped patients around the world heal from psychological issues such as autism, ADHD, depression and anxiety, as well as from physiological (body related) problems like autoimmune conditions, chronic fatigue syndrome and fibromyalgia, arthritis, headaches, PMS and all digestive disorders. Therefore, GAPS also stands for Gut and Physiology Syndrome. The body gets nutrition to build and rebuild itself through the digestive system. Unfortunately, in the world today and especially in the United States, the standard American diet (SAD) not only cannot sustain the body, but it leads to the deterioration of it. Our lifeless processed food does not give our body what it needs to build new tissue. One of the first places to be damaged is our intestines which become permeable or otherwise known as “leaky gut”. In addition, our overabundance of sugar caramelizes in our blood vessels wreaking havoc on our brains, eyes and nerves (and elsewhere). When we have a leaky gut, things that aren’t supposed to get into our blood stream do and these can cause issues all over the body. A major contributing factor to this is an unhealthy microbiome. I strongly encourage you to read this article to understand why our microbiomes are imperative to our health. What do we do in GAPS? We heal and seal that leaky gut with a healthy diet including lots of meat stock, grass fed/wild meat and animal fats and probiotic rich fermented foods. As we’re healing and sealing, we’re working toward reducing the toxic load on the body. This second part is so important because, unfortunately, we live with an overabundance of chemicals that our bodies can no longer handle. What is the end result of GAPS? A digestive system that takes in what it needs to build healthy tissue while preventing the bad stuff from leaking through and causing dis-ease. We fix what’s broken and the body works like it’s supposed to. Real food ~ it’s the new medicine. Beet kvass is an amazing liquid for digestion (and so much more). And beet kvass can literally be made in less than 10 minutes, minus the time it sits on your counter fermenting. 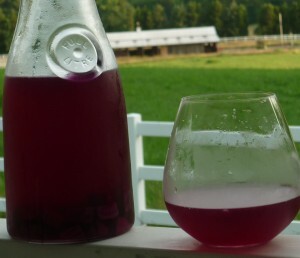 From Nourishing Traditions we learn: “One 4-ounce glass, morning and night, is an excellent blood tonic, promotes regularity, aids digestion, alkalizes the blood, cleanses the liver and is a good treatment for kidney stones and other ailments.” And unlike medicine from the store – absolutely no harmful side effects. An Internet search of the benefits of beets will keep you reading for days. A search in PubMed points out the benefits of lowering blood pressure (among other things) as well as increasing exercise performance. So we have this wondrous root vegetable which we then take and lacto-ferment. The Weston A Price Foundation is a wonderful source for information on lacto-fermented foods like beet kvass. Every group of people Dr. Price studied consumed some fermented food in their diet. Through the ages they had paid attention to what happened to their foods when trying to store them. They learned to harness the power of nature to preserve food naturally and in the process that food became more nutrient dense with enzymes and healthy bacteria. 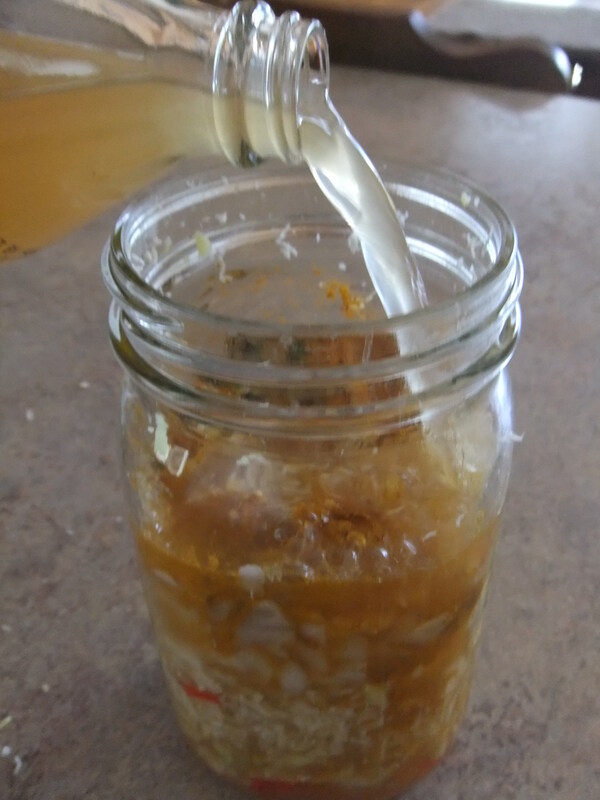 Before the days of refrigeration and canning, food was preserved through a process called lacto-fermentation. Lactic acid is nature’s best preservative – it inhibits putrefying bacteria. Starches and sugars in vegetables and fruits are converted into lactic acid by lactic-acid producing bacteria that are present on the surface of all plants and animals. These bacteria synthesize nutrients that are essential to us, enable us to digest nutrients that we otherwise would not be able to digest, make nutrients bio-available to us, and work with our immune systems to protect us. The nutritive elements in our food do us no good if our bodies cannot assimilate them. Food preparation and processing should make our foods easier to digest. Unfortunately, most food processing techniques, such as canning, preserving in sugar and chemicals, pasteurizing and irradiation, all make food much more difficult to digest. When we consistently eat foods that are difficult to digest, we compromise our vitality because the body is forced to use a great deal of energy breaking the food down. People who do take the care needed to prepare food in such a way to make it easier to digest report increased energy since the body does not have to work so hard at digestion. 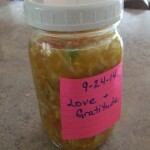 Fermenting makes enzymes – enzymes break down our food. More and more we see probiotics (good bacteria) and enzymes in stores and on commercials. When we ferment, we get these substances naturally. 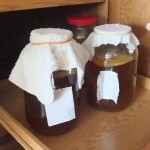 What do you need to make kvass? Here is all you do: Put the beets, whey and salt in the jar and fill it to about an inch from the top with filtered water. Stir well and cover with a cloth and rubber band (to keep out fruit flies). That was easy. 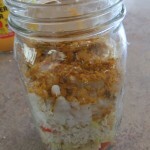 Now leave the jar at room temperature for 48-96 hours then put it in the frig. You’re done. I have found that I personally like to do about 3 days when my house is around 70 degrees. In Nourishing Traditions, Sally says that once you’ve consumed most of your first batch, you can refill the container with filtered water, set it back on the counter for 2 days and have another slightly less strong batch. After that, your beets are pretty well spent, so just throw them in the compost pile and start over again. Over the years, I’ve learned to add water to the jar each time (or every other time) to refill it, put it back in the frig and just keep doing that until it tastes weaker than you like. I’ve found I get a lot more use out of my beets when I do that. I like to keep at least 2 batches “brewing” in the frig. 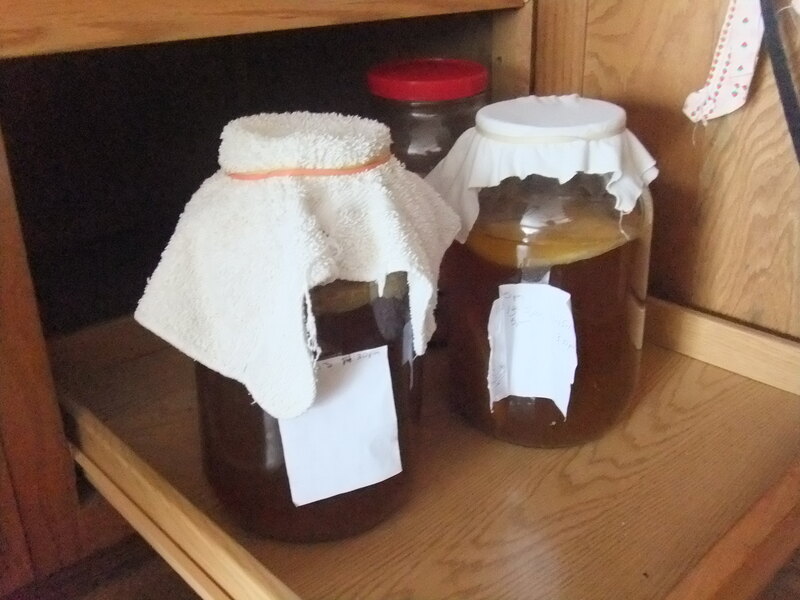 Just like kombucha, the kvass continues to ferment at cool temperatures, but much more slowly than on the counter. I think it tastes bests when it’s been in the refrigerator for 3+ weeks. To me, beet kvass is the simplest way to add the benefits of lacto-fermentation to our daily routine. Sauerkraut is also incredibly easy, it just takes a bit more time to prepare the cabbage. Hopefully this will motivate you to give kvass a try. One more way for you to have real food for real health so you can be real happy. Remember that real food is the new medicine (actually, it’s always been). Dr. Dan Gleason and I recently shared a presentation at Nourishing the Lakeshore, our local chapter of the Weston A. Price Foundation. This post is based on our presentation. How common are thyroid issues? This is a tricky question. The Cleveland Clinic says about hypothyroidism that it “has a total prevalence of 1% to 2%,1 increasing with age (~10% adults >65 years). In the U.S. population, the prevalence of biochemical hypothyroidism is 4.6%, but clinically evident hypothyroidism is present in 0.3%.” However, iodine and thyroid expert Dr. David Brownstein estimates that as many as 40% of the population may be suffering from hypothyroidism. The numbers are much lower for hyperthyroidism, thank goodness. There are those who actually have lab numbers out of range. But then, even more people have numbers in the normal range so their doctors tell them they don’t have an issue. The “normal” range .5 to 4.5 (a range big enough to drive a bus through) is based on the labs scores of average people and the average person today is not really healthy. 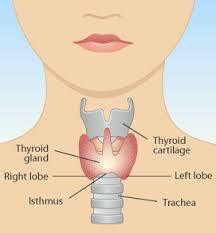 If your TSH is within range your thyroid isn’t necessarily functioning optimally. Dr. Broda Barnes cautioned that hypothyroidism is the “unsuspected illness” because lab values can appear normal and thus the problem goes undiagnosed. He strongly advised using basal temperature readings to help determine thyroid functioning. Dr. Brownstein sites that through his experience, a more optimal TSH range is between .3 to 2.0. What are some of the signs of an underactive thyroid? What are some of the signs of an overactive thyroid? 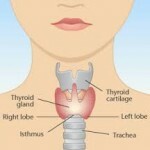 What toxins contribute to thyroid problems? What nutrient deficiencies can lead to thyroid problems? What other issues can lead to thyroid problems? What’s in water that hurts your thyroid? NOTE: Keep in mind the water that serves as the base for drinks like bottled sodas, bottled teas and fountain soda is fluoridated. Then, what should I eat? Much of the information provided in our presentation was taken from the Dr. David Brownstein’s book OVERCOMING THYROID DISORDERS which we highly recommend. Additional information came from THE IODINE CRISIS by Lynne Farrow, which will be discussed in my next blog post. I never thought I could consume liver in anything but dessicated form, encapsulated. Then I became a regular at the Weston A Price Foundation conferences and at least ate liver during the meals where the gourmet chefs were preparing it for all the attendees. After 8 years of reading over and over again about the nutrient density of this superfood, liver, I figured I better come up with a palatable way to consume it that was easy to make. I think I’ve done it. In fact, my dear friend Allison, says it’s the best she’s ever had. 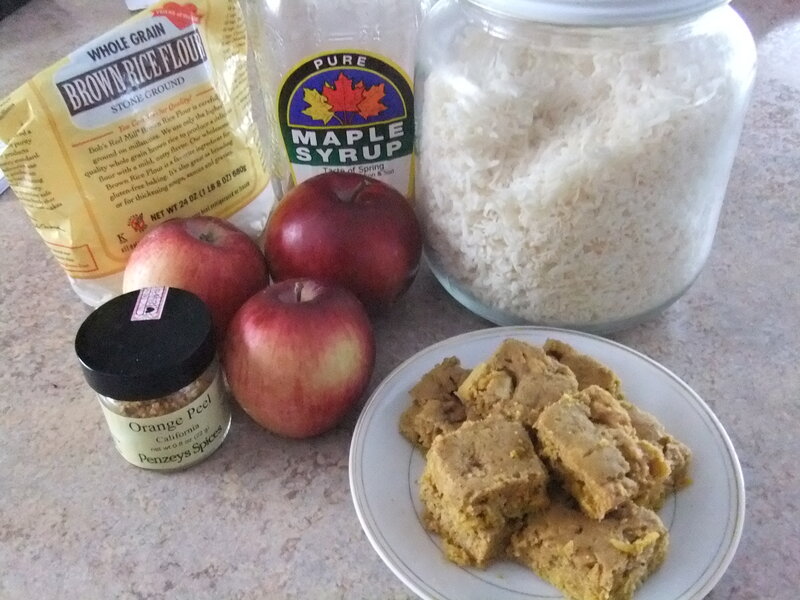 So I figured I better share the recipe with others who want to add it to their diet. Crush the garlic cloves and set aside to activate the good stuff in it. Cook up the bacon, then set it aside and break/cut it into 1-2 inch pieces when it cools. Add the onion and bacon grease and cook on low, covered for about 10 minutes, stirring occasionally. Add the livers and garlic and cook about 10 minutes more. You may need to bump the heat up a tad. Then add the wine, greens and salt, cover and put on the lowest heat possible for about 5 minutes. 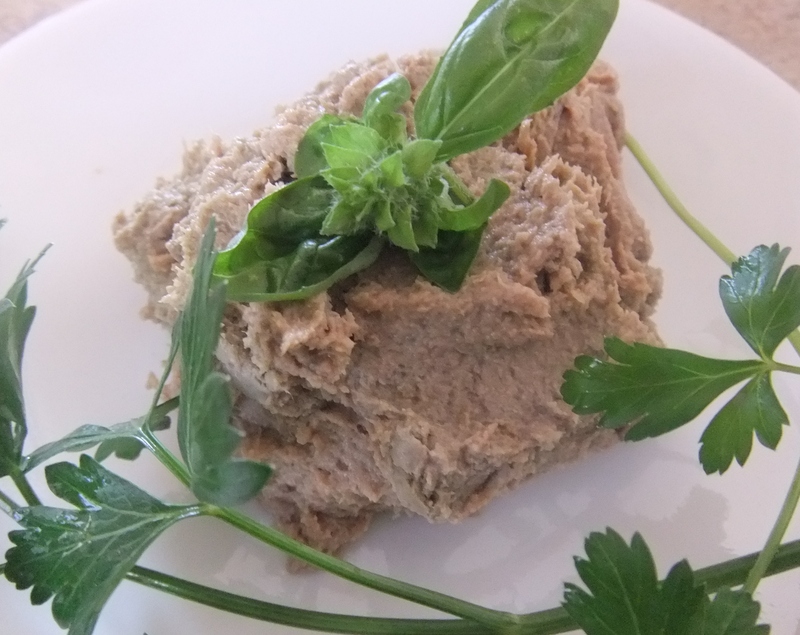 If you love pate, eat it plain. If you love sourdough toast, spread it on. If you love carrots and veggies, dip it. If you are new to liver, mix a tablespoon into your soup or casserole. If you are a bone broth lover (and want to down the liver quickly) – add a tablespoon or 2 to your broth and drink it down. I recommend that you consume your creation within 4 days of making it. Store pate in a covered glass container. You can pour melted butter over it for storage purposes, but folks like myself who are casein sensitive should avoid that practice. Wishing you real food – it’s the new medicine, you know. As the New Year progresses, more and more people are jumping on the opportunity to detoxify their bodies. 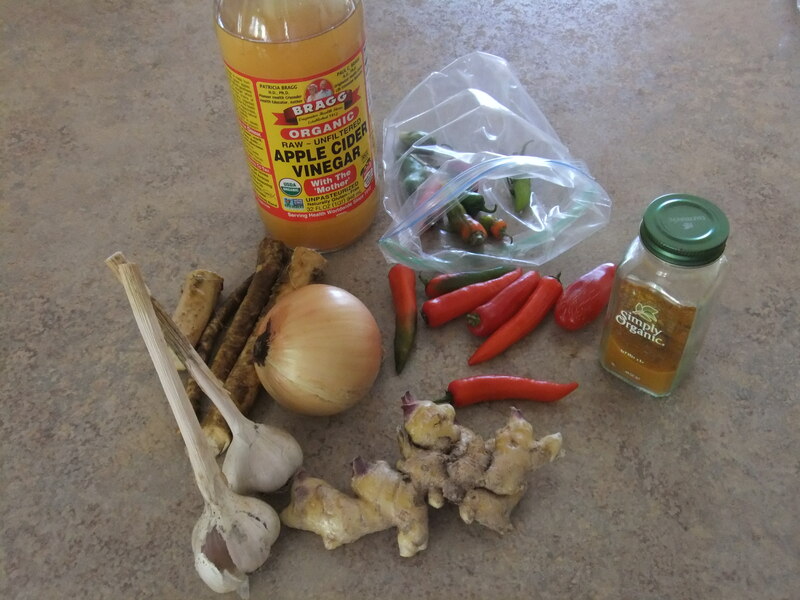 Here’s a simple recipe that helps support the liver’s detoxification pathways. 1/2 tsp. organic seasoned salt. Place herbs on top, cover, cook on low all day. 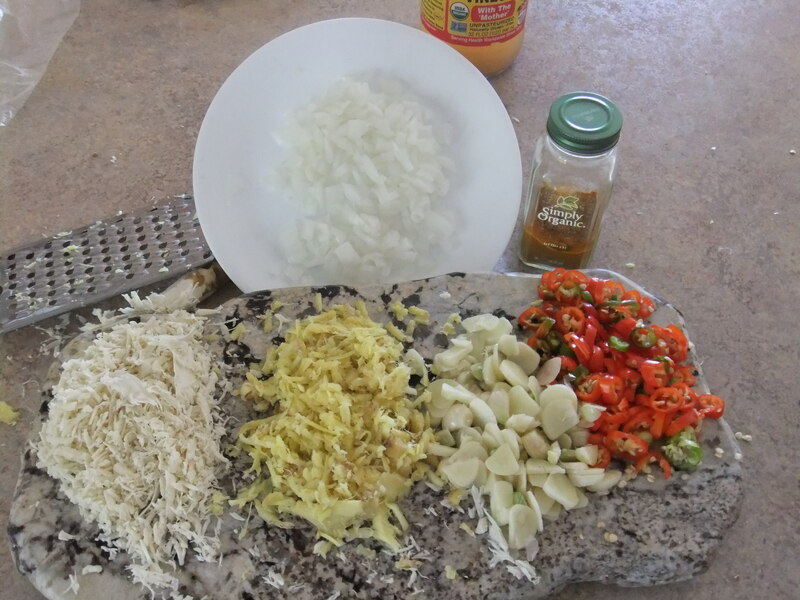 Hint….add whatever veggies you have on hand. Chicken should be 160+ degrees. Welcome to 2015 health conscious truth seekers. I decided to take a friend’s suggestion and change my tag line. I hesitated because it was Hippocrates, way back in 460 B who said, “Let food be thy medicine and medicine be thy food.” That’s hardly new. Of course, back then, all food was organic, heirloom and chemical free. But then through the ages, especially in the last 50 years, our food supply experienced a toxic transformation. Simultaneously and insidiously, the food industry and Big Pharma took over the media to create a perfect storm against good health. Fortunately, there are a growing number of folks who see that the resulting food-like substances being passed off as “healthy” can’t build and sustain healthy cells, tissues, organs or bodies, and they contain toxic ingredients and chemical residues from pesticides and processing. To top it all off, a good share of the time in this country, if we’re eating processed food, we’re eating genetically modified organisms (GMOs). Unlike other countries, the U.S. doesn’t even have to label these Frankenfoods. The result of the food monster? We get sick. So, we turn to the doctor for help. But we have been blinded by Big Pharma to the reality of the chemical medications. The side effects alone should be clear warning that something is not right. It is a fact that many medications are prescribed (or taken over the counter) for more than a year or two, even though they had never been tested for long-term use. To add insult to injury, synthetic drugs aren’t adequately tested for potential antagonistic effects when used with the countless other drugs out there on the market. The kicker is this: many also damage the digestive tract and keep us from being able to take in nutrients we need to heal and stay healthy. Scary. So, our well meaning doctors who are under the heavy influence of Big Pharma are maintaining the widespread delusion that chemicals created in a lab are somehow the answer when the body breaks down. Because the breakdown is from too many toxins and/or not enough nutrients, the perfect storm of ruined food and medicines engulfs us in wave after wave of sickness, or, at least, chronically bad health. To regain health and maintain it, we must first build a healthy body. Most importantly, we can only do this with real food. When we eat real food we build a strong body that can thrive and handle the demands of our modern world. Real food is food grown in our own communities (so it’s still fresh and nutrient rich) on organic farms (to minimize toxins and increase minerals). Real food needs to be from grass-fed, free range animals and wild harvested fish , raised, caught and/or harvested by ourselves or our neighbors (good for self-esteem and the local economy), and prepared traditionally. Whew! Does that sound complicated? Nah. It’s really quite simple to be healthy. We can do it — once we are able to get past the artificial reality created by mass media for the benefit of the food and drug industries. We can reclaim real food for all the pleasure and health benefits it brings to us and our families. Then we break the cycle of illness and enjoy vibrant health. We can thrive. Of course, we’ll still get sick now and then. There will be times when our immune system is challenged. When this happens, we need to reject harmful drugs and instead look to natural remedies to heal infections and relieve discomfort. (Although, when there’s an accident, modern medicine IS the place to turn to for trauma care.) We are lucky. Our ancestors and current health trail blazers provide us with a cornucopia of effective and safe medicines in the form of herbs, essential oils, naturopathy and homeopathy, chiropractic, massage, even physical therapy. Now, this is where I come in. When clients come to me, it’s usually because they have a current issue of dis-function with their bodies. They’ve been caught in or are trying to avoid that perfect storm of ruined foods and toxic medications. I teach them to reclaim real food for themselves and their family and lead them to natural remedies that can heal and build health – – instead of just masking symptoms. Whole grains (still thought to be super foods) – if not prepared properly or if someone is sensitive, are responsible for everything from weight gain/loss, to brain fog, skin eruptions, fatigue, bloating and diseases like Celiac. 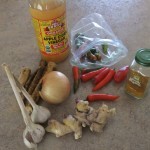 Plague Tonic – the only flu shot I’ll ever recommend. We’ve got to get back to the basics and build our bodies with real food. It’s the new medicine. 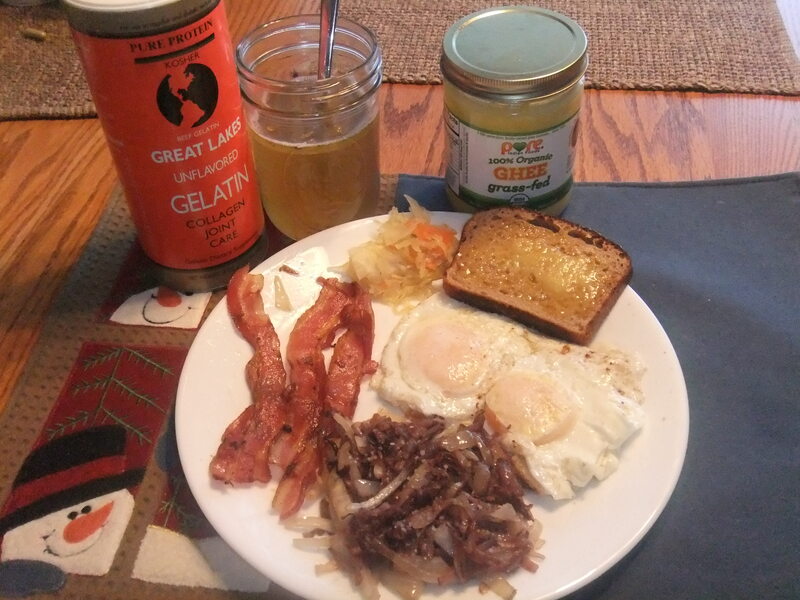 * Typical Breakfast for me includes 2-3 pieces of local, free range bacon, 2 (local, non-gmo fed, grazers) eggs, a fried shredded purple potato (love that resveritrol) with onion (all from Sweetwater Organic Local Foods Market), organic true sourdough kamut (an ancient grain) toast with ghee (since I can’t do butter – if you’re not allergic – EAT BUTTER!!! 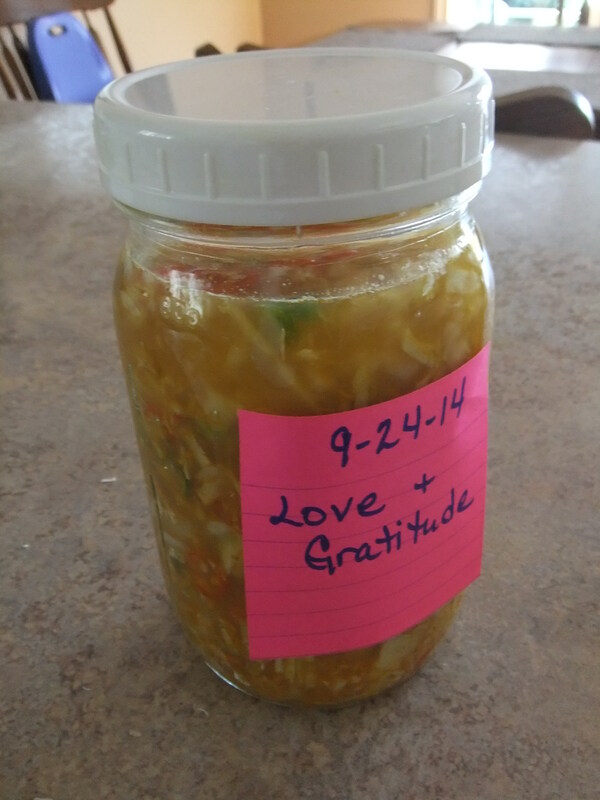 ), a tablespoon or two of homemade sauerkraut (made with cabbage and carrots from Earthscape and Maple Moon), and a cup of warm bone broth (made with chicken bones from Hickory Ridge or beef bones from Crane Dance). This breakfast is far from the unnatural and cruel modern dietary recommendations that leave us hungry and unsatisfied. Recommendations that don’t specify organics and are low-fat are based on sales, not health. Eating truly healthy foods like those pictured above changes our relationship with food. Eating is a nourishing and very satisfying experience. Forever wishing you real food for real health so you can be real happy. 2. Pour into glass vessel and add ½ cup sugar (or you can do this in the pot). Stir to dissolve. 5. Cover with cloth and rubber band and set out of the way (70-75 degrees is nice) for 7-10 days. Label with date. I like to put “Love and Gratitude” on the label to, with lots of positive intentions. Use only organic tea bags, with no staples in them. NO METAL – SCOBYS NO LIKE. Green tea has less caffeine and scobys really like black tea. Buying boxes of 100 is very economical. 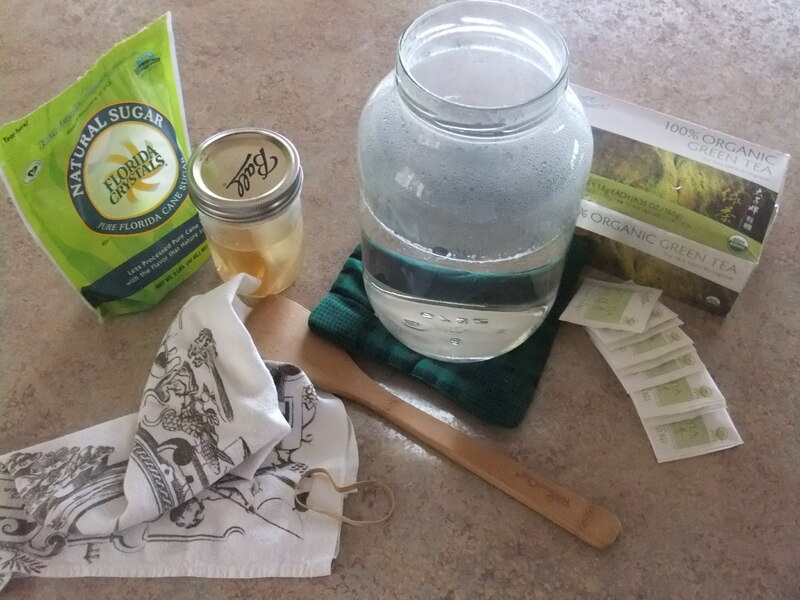 YES, you can use loose tea…in a dye free muslin bag is great. Sugar – must be organic from sugar cane (may say dehydrated sugar cane juice). Costco is the best price I’ve seen ($8.99 for 10 pounds). Non-chlorinated water is a MUST; filtered water is best. Big grocery stores like Meijer have reverse osmosis machines where you can fill your non-BPA plastic jugs for less than 50 cents. 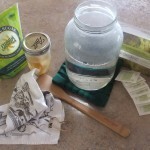 Kombucha scobys multiply with every batch – it’s a good idea to separate them each time and put the extras in a jar with some starter tea…a scoby “motel” if you will. Then you can share! Your brewing kombucha likes temps around 70 and 80 degrees. Cooler…won’t grow as fast, and warmer….well, don’t do warmer if you can help it. 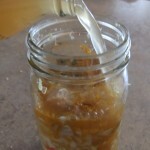 While brewing, your scoby may float or sink or grow weird stringy things. It’s all good. Chocolate mint sprigs – my favorite! 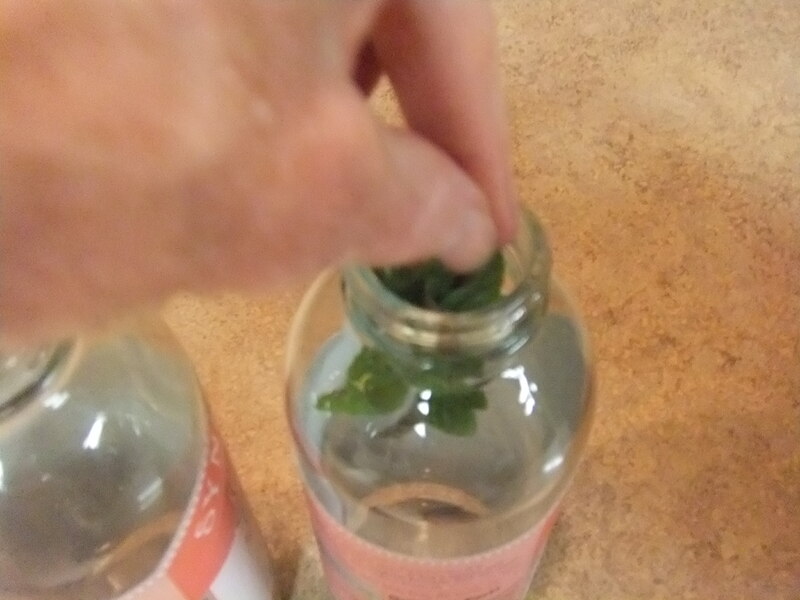 Once your kombucha is brewed the way you like it (usually 7-10 days) (you can stick a straw in it while it’s brewing, put your finger over it, pull it out and taste it), pour it into a glass measuring cup or pitcher (this makes it easier to pour into bottles). You can store it in any size GLASS vessel. Place flavoring (i.e. 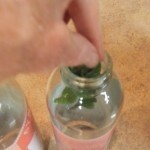 mint, ginger, blueberries, grapes, other pieces of fruit) in the bottom of the bottles. Pour in the kombucha and put lids on your vessels. Place the vessels in the cupboard for another 2-10 days – the longer the bubblier. Then put in frig. This post is dedicated to all the new “boochers” from my WLACE classes, Nourishing the Lakeshore, Fermenting the Lakeshore, Moondrop Herbals and my most recent detox group. As always, wishing you REAL food, for REAL health, so you can be REAL happy. Dedicated to the Fall 2014 class of Fermentation 101. Welcome to the world of culture! It’s that time of year again…time to prepare for cold and flu season, especially because flu shots are being given. If you didn’t know already, flu vaccines shed. That means if someone in your home or office gets a flu shot, you could get the flu just being around them. So,there are an awful lot of “bugs” out there and we will be prepared to fight them in a few weeks with our plague tonic. When I’ve felt something coming on, I take a tablespoon 3 times a day, and usually can fight off whatever is trying to take hold. Friends and family who’ve been sick for a while and “just can’t shake” something, try the tonic and experience healing within a couple/few days. Let’s get started. 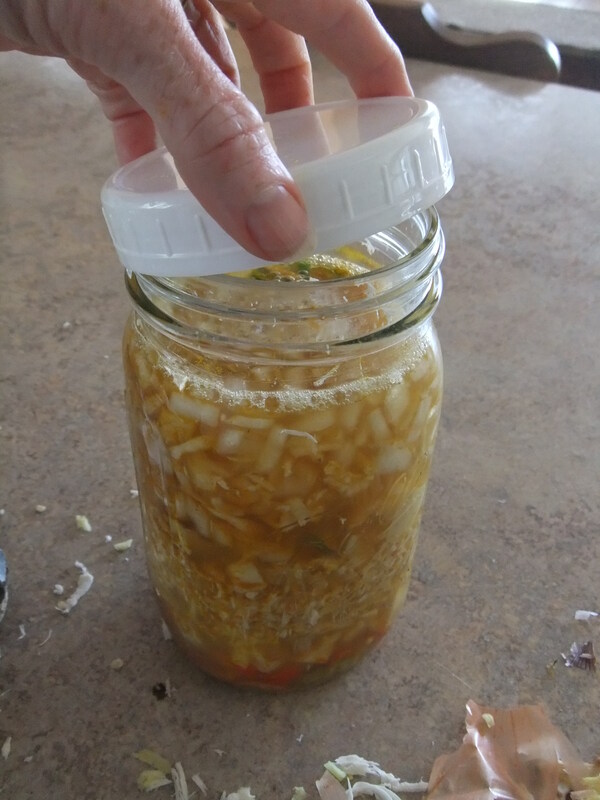 You’re going to need a glass jar (probably a quart) with a plastic lid (it will eat metal) and some Bragg’s Apple Cidar Vinegar (unless you can get homemade). 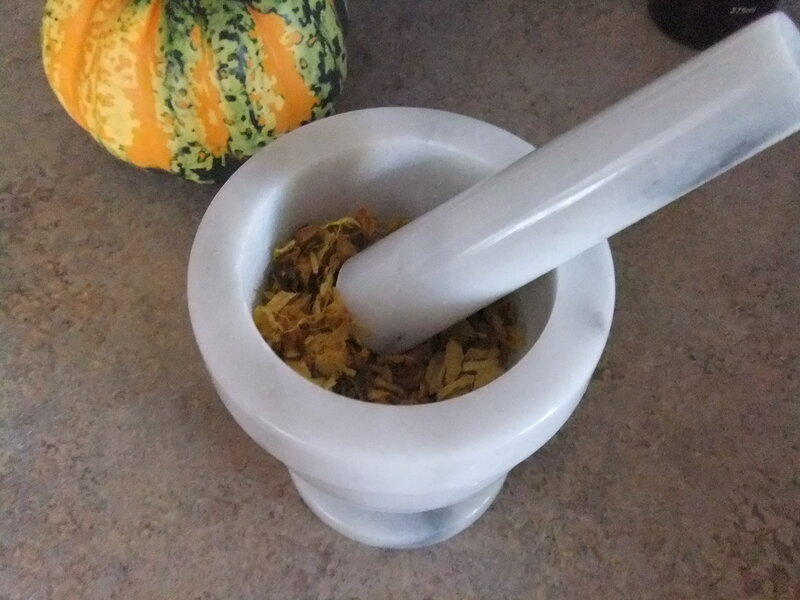 Turmeric root (this can be hard to find, so if all else fails, use a nice big teaspoon of turmeric powder). 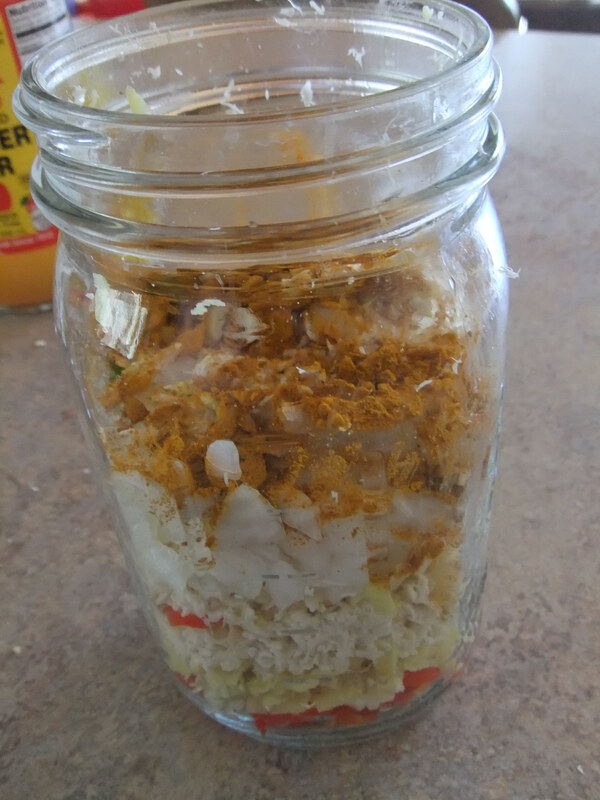 Place all the ingredients in your glass jar so it’s filled to a couple inches below the lid. Cover with ACV and put on the plastic lid. 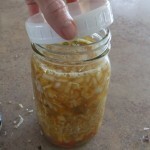 Shake well & add a bit more vinegar to bring up to about 1/2 inch of the top of the jar. Label your jar with the date. For those of you who know me well, I always include “Love & Gratitude” on the label based on the work of Emoto. If you have lots of different jars going, you might want to put “Plague Tonic” on the label also. Every day for the next 2-3 weeks, you’re going to shake your jar a couple/three times a day. 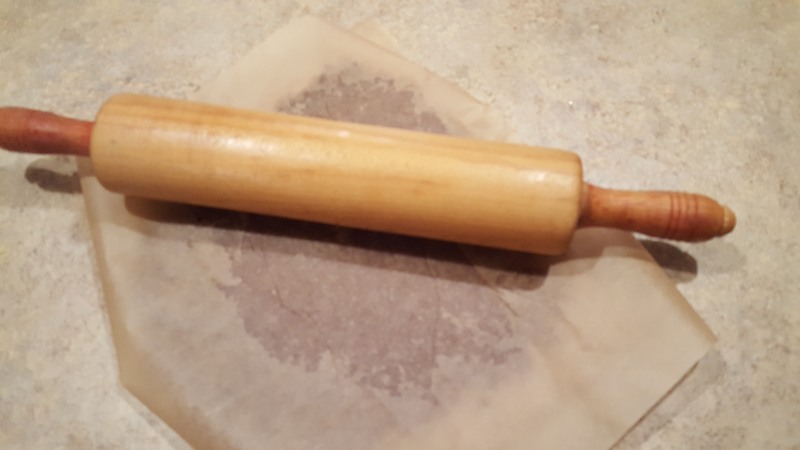 After that, you can filter it through an unbleached coffee filter (or cheesecloth). 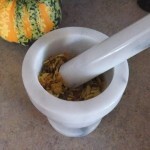 The “chunks” can be dried and used later as spice if you like (I crush mine with a mortar and pestle). At the first sign of cold or flu, take a tablespoon (can be diluted for grown-ups and should be for kids). Two to three times a day will stop most bugs in their tracks. As always, wishing you REAL food (and tonics), for REAL health (without meds) so you can be REAL happy. Thanks to Vicki R. and Granny Good Food for sharing this two years ago. You’ve helped many more than you know.